The folks at the Chrysler Group’s SRT division have offered up a new video of their purpose built 2013 Viper GTS-R race car in action – this time tearing around the turns of Virginia International Raceway – perhaps offering a hint as to when the Viper will make its long-awaited return to the world of the American LeMans racing series. The Street and Racing Technology (SRT) division of the Chrysler Group showed off the first video of the new 2013 SRT Viper GTS-R race car earlier this month but this new video is of special interest because of where it takes place. The first Viper GTS-R video was shot at Carolina Motorsports Park whereas this new piece was captured at Virginia International Raceway. The reason that this difference is significant is because the American LeMans Series (ALMS) makes a stop at VIR on September 15th for the second to last race of the 2012 season. The Viper GTS-R has been slated to return to the ALMS during the 2012 season and although rumors have surfaced as fast (later to be debunked) that the Viper would return to endurance racing sooner in the season – none of those rumors have turned out to be true. However, could this 39 second video of the unpainted 2013 SRT Viper GTS-R screaming around Virginia International Raceway be a hint that the Viper will return to the ALMS on September 15th? There are five races between now and the September 15th race at VIR with stops at Lime Rock Park, the Canadian Tire Motorsport Park, the Mid-Ohio Sports Car Course, Road America and the Baltimore Street Circuit. 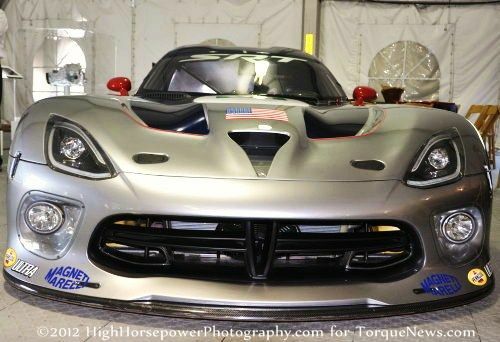 Honestly, I would be a little surprised to see SRT wait that long to get the Viper back into racing but with the folks from SRT making sure that this new factory backed race car is 100% ready, the team looks to be taking their time getting the Viper into the big field. Should the 2013 SRT Viper GTS-R wait until the September 15th stop at VIR to re-enter the American LeMans Series, that means that the new Viper race car will likely take to the track for the season finale – the Petit Le Mans at Road Atlanta – a race in which the Viper claimed victory over a decade ago. Team SRT will likely field two cars whenever they do return with Dominik Farnbacher, Marc Goossens, Ryan Hunter-Reay and Kuno Wittmer taking care of the driving duties as the Viper takes on the likes of the BMW E92 M3, the Chevrolet Corvette ZR1, the Ferrari 458 Italia and the Porsche 911 RSR. The video below shows just 39 scant seconds of the 2013 SRT Viper GTS-R roaring around VIR and while this is shorter than most Viper and Chrysler Group enthusiasts would like – this piece offers a great look at the new race car in action on the course that could mark its reintroduction to endurance racing. It also sounds awesome…so make sure that those speakers are turned up.